Camping goes hand in hand with summer adventures: pitching a tent lakeside, making a campfire, roasting s’mores and philosophizing under the stars into the early hours of the morning are what some of the best summer memories consist of. As an experienced three season camper and backpacker and having spent countless nights under clear skies, rain, and wind alike. It wasn't until this year that I had ever considered camping in that fourth, dark, cold season. The thought of staying outside for an entire night in freezing temperatures made me uneasy, but I live for camping and adventure. So I planned to head to Washington for New Year’s Eve, the perfect setting to try winter camping for the first time. It's a good idea to pick an easily accessible spot for your first winter camping experience in case something should go wrong. I picked Artist Point in Mt. Baker’s backcountry. The view from Artist Point is renowned as one of the best views in the Cascades and it did not disappoint. The area is a winter wonderland with snow-covered trees, expansive mountain peaks, and pristine snow as far as the eye can see. Artist Point was also just a 2 mile snowshoe trek from the parking lot and always in view of the Mt. Baker ski resort which was comforting. In case the night got to treacherous, we could pack up and be back in the warmth of the car in less than an hour. For other new winter campers I would recommend a similar approach. Even if you have no plans of ending the trip early just the knowledge that warmth is nearby will offer peace of mind in the depths of the night. Winter camping can be intimidating but with the right gear it is possible to brave even the most brutal of elements. First start with clothing yourself in the proper attire. In the winter you must wear layers as your body heat will inevitably fluctuate throughout the day. When you are engaging in physical activities during the day the sun will quickly warm you up allowing you to shed layers, but the moment it dips below the horizon a chill sets in and you will need to bundle. Three layers are key: a moisture managing base layer of wool, an insulating layer of fleece or down, and finally a weatherproof shell. In order to be the most comfortable when I camped I wore my fleece and down jacket over my merino base layer. Hats will also help keep in your body heat so I kept mine on even as I slept. Another important factor in staying warm is your sleeping bag choice. For winter conditions a sleeping bag with a 10-degree rating or cooler is imperative. If you have a three season sleeping bag and are not sure if you want to invest in another sleeping bag solely for winter use you can purchase a thermal sleeping bag liner that can lower the temperature rating of your bag by 25 degrees. Finally, the tent. Tents are expensive but luckily places like REI and other sport retailers rent them and are extremely helpful in making sure you walk away with the tent that is appropriate for the conditions you could experience. I spent hours online researching different brands and tents and finally settled on the Mountain Hardwear Tangent 2 tent. So far, so good. The tent is easy and quick to set up and has stood the test of blizzard conditions in Mt. Rainier. This is the part I was most nervous about before embarking on this adventure. I run cold and even indoors I can become chilled wearing sweatshirts during the winter. After we set up camp and the sun set, we climbed into the tent and into our sleeping bags. Despite the fact that the snowshoe to the campsite was hot due to the sun, the night was cold. Temperatures dipped into the teens but my layers and gear kept me surprisingly comfortable. This is not to say I was warm, I just wasn’t freezing like I was so certain I would be. One of biggest benefits of spending the night under the stars is just that — the stars. It's an incredible feeling to step outside a tent and look up at the canopy of stars overhead. It is a more comfortable experience in the summer but is just as beautiful in the winter even if you only stand outside for a few moments before retreating back to the comfort of your sleeping bag and tent. 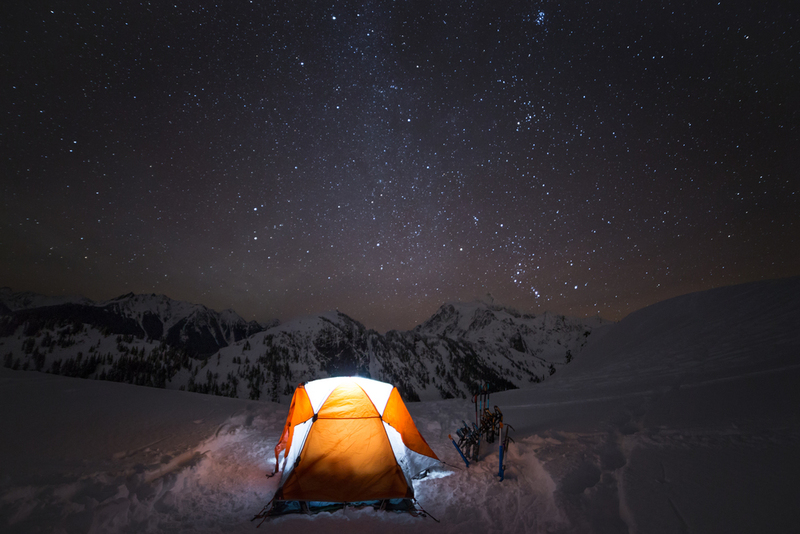 Another aspect of winter camping that is entirely different from its warmer counterparts is the nights that can be seemingly endless depending on the month and location of your camping trip. Darkness lasted 15 hours during my night on the mountain. That is a long time to try to sleep but luckily we had games to keep us occupied until it was time to rest. By the time the sun rose there was frost built up on the inside of the tent but I was comfortable inside my sleeping bag. Reluctantly, I ventured out into the cold and packed the gear up. When we finally headed back down to the car the sun was warming me and I had almost completely forgot that I was huddled in my sleeping bag just a few short hours earlier. Overall the experience of winter camping was unforgettable. It seemed so intimidating in the weeks leading up to the adventure but ended up being one of the coolest (pun intended) experiences I've ever had.